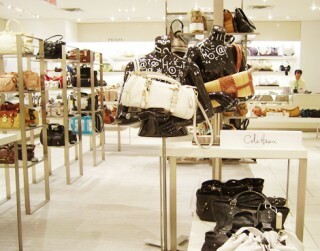 Coveted handbags are a big draw at Holt Renfrew. Shopaholics were aghast at the news that high-end retailer Holt Renfrew would close its Ottawa location in early 2015. And while it’s always been one of those “aspirational” destinations, here at SHOP TALK we were pretty bummed. If shopping can be compared to art, then a visit to Holts was akin to stepping into the National Gallery — it wasn’t so much about filling gaps in our wardrobe as it was about stimulating our fashion senses. And for that, Holts will surely be missed. That, and the stellar work they did with their window displays! I don’t know who is going into that retail space, but it’s safe to say that corner of Queen Street will never be the same. And allo! to J. Crew. One week later, On September 3, J. Crew opened its doors in the Rideau Centre. SHOP TALK attended the breakfast opening and got a better understanding of the brand we’ve heard so much about. And though it’s doubtful we’ll ever get to shop the pieces from that J.Crew showed earlier this week at New York Fashion Week, or even from it’s beautiful ready to wear collection (see left) we were excited to see the diversity of offerings — I had seen it as a preppy brand (no objections there!) but was happy to see some more casual pieces as well. Sarah Fischer, who has shopped J. Crew before in the U.S., was excited about the fun prints. The Tick Tock blouse, which we spotted on a few staff, spoke to her love of classic pieces — that don’t take themselves too seriously! 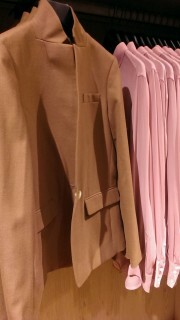 And we loved this blazer — good to see camel staying strong for fall, it’s such a versatile and classic colour.